MISSION, KS--(Marketwired - Mar 17, 2014) - (Family Features) The Midwest and Mid-Atlantic have been plagued with above average snowfall and below average cold temperatures throughout the 2013-2014 winter season. As the meteorological winter's three coldest months of the year finally come to a close, homeowners may find that the wrath of this winter has left long-term damage in its wake. In regions hit hard this winter, the seemingly harmless icicles dangling from rooftops may actually signal potential ice dams. 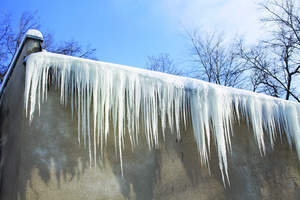 An ice dam is a wall of ice along the edge of the roof that forms when melting snow continually thaws over warmer portions of the roof and refreezes along the roof's colder eaves. The melted water that pools behind the ice dam gets trapped, creating the potential to leak into the home and cause damage to walls, ceilings, insulation and other structural areas. Residential markets with a history of ice formation now benefit from the 2006 building codes mandating ice dam protection as part of a new roofing system installation. However, a large majority of homes in these areas still have roofs that pre-date the adoption of these building codes, making them more vulnerable to ice dam formation. 1. Preventive: Proper attic ventilation and insulation. The first line of defense against ice dams is having proper attic ventilation and insulation. Adhering to Department of Energy (DOE) recommendations for insulation and the International Residential Building Code (IRC) for ventilation in attic spaces will help prevent heat loss from inside the home to the attic which causes temperature fluctuations that accelerate conditions needed for ice dams to form. Another helpful preventive measure is to have your gutters and downspouts cleared of debris each fall before winter strikes. This helps the water from melting snow drain off your roof and away from your home. 2. Protective: Removing snow loads from your roof. Homeowners can also help protect their homes from ice dam formation by removing the heavy snow load from the roof after each significant snowfall themselves or by hiring professionals. Using safety precautions and avoiding unstable surfaces, homeowners can use a roof rake or push broom to carefully remove the snow from the lower edge of the roof. Experts recommend pulling snow down the slope of the roof line to avoid damaging the shingles. 3. Proactive: Bring in the trusted experts. If you suspect ice dams may have formed, don't wait for water damage to occur before you take action. Proactively hire a local expert who can evaluate your roof for damage and determine if any additional shingles or underlayment is needed for added protection. The national network of Owens Corning™ Roofing Preferred Contractors makes it easy to find a professional roofing contractor in your area. Simply visit www.owenscorning.com/Roofing to request estimates from multiple roofing contractors in your zip code using an online submission form. As temperatures start to thaw, don't let winter's wrath linger on your home. Following these preventive, protective and proactive steps can help you eliminate the culprits that lead to ice dam formation.